The third volume in a series of four includes the stories Nicholas Hagger penned during the 1980s. They explore the themes of belief, harmony and acceptance. 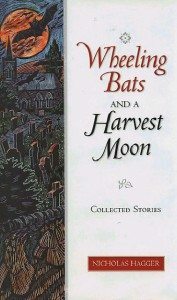 Wheeling Bats and a Harvest Moon is the third collection of Nicholas Hagger’s stories. The first collection, A Spade Fresh with Mud, includes stories written in the 1960s on themes of exile, self-interest and freedom. The second collection, A Smell of Leaves and Summer, focuses on peace and spiritual love following the author’s experience of mystic illumination in September 1971. In Wheeling Bats and a Harvest Moon, through observing people from many walks of life in everyday social situations where awareness of ultimate reality is never far away, Nicholas Hagger explores belief, harmony and acceptance. His illumined approach reveals a fresh, solid universe in which we live our varied lives under the mystic Light, the enduring One, like bats wheeling backwards and forwards across a harvest moon. Nicholas Hagger’s world is alive with significant detail captured in memorable images. Observant, penetrating and compassionate, he sees to the heart of situations and has developed the story in miniature, at once vivid, economical and revelatory, into a genre uniquely his own. Hagger’s short stories present a thousand experiences in the life of Philip Rawley spanning five decades. They reveal his quest for Reality and condemn the follies and vices of the Age. They bring a new approach to the short story and are very readable.